The Seleka rebel coalition launched its offensive in December, accusing President Francois Bozize of reneging on a peace deal . NEW: Rebel official: "The Central African Republic has just opened a new page in its history"
(CNN) -- The president of the Central African Republic has fled the country's capital and rebels have seized control of the city, a government official said Sunday. President Francois Bozize crossed into the Democratic Republic of Congo, said Jules Gautier Ngbapo, a spokesman for the government's territorial administration minister. He declined to disclose Bozize's location Sunday. Read more: What's behind the unrest? "The Central African Republic has just opened a new page in its history," said a written statement from Justin Kombo Moustapha, secretary general of the Seleka rebels. The statement described Bozize as the country's former president and urged residents of the landlocked country to remain calm and prepare themselves to welcome rebel forces. Word of Bozize's surprise departure came as violence erupted in the capital, Bangui. Read more: Who are Seleka? Witnesses reported hours of gunfire, and Ngbapo said at least seven civilians were killed as rebels and local residents looted shops. Some South African soldiers were killed in clashes, according to a statement from the office of French President Francois Hollande. South African officials could not be immediately reached for comment. A United Nations spokeswoman based in Bangui described the situation as confusing and very tense. "A number of U.N. offices have been looted as well as residences of some U.N. personnel," spokeswoman Uwolowulakana Ikavi said. Sounds of fierce gunfire rang out for hours Sunday, she said. The country has been on edge since rebel fighters pushed their way into the capital. 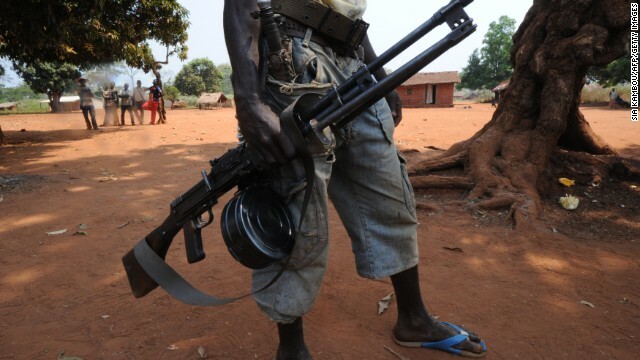 The wave of unrest started in December, when the Seleka rebel coalition launched its offensive. The rebels accused Bozize of reneging on a peace deal and demanded that he step down. The rebel group, based in the country's north, managed to take control of several towns and move toward Bangui in the following weeks. The Seleka and the government brokered a new peace deal in January, agreeing to form a unity government led by Bozize. But that peace deal also fell apart. On Saturday, about 150 French troops secured the airport in Bangui. France also asked for an urgent U.N. Security Council meeting to address the crisis in its former colony. Hollande's office said the French president had spoken Sunday with South African President Jacob Zuma, expressing condolences for the soldiers' deaths. "They called on all the parties to be calm," the statement from Hollande's office said, "to stop looting and to respect the political accords of Libreville," where leaders signed a peace deal in January. The African Union condemned the Seleka rebels' renewed offensive and also announced a travel ban and asset freeze against political and military actors involved in violating humanitarian rights or the January peace agreement. Meanwhile, on Sunday, U.N. officials in the Central African Republic were preparing to evacuate. U.N. staff on the ground in Bangui are not allowed to leave the compound, Ikavi said, and non-essential staff will be evacuated or relocated once the security situation allows. "As a human being, I am afraid," Ikavi said. "No one can stay calm when you hear heavy shooting not far from the place that you are staying." CNN's Jennifer Deaton contributed to this report.